Welcome to the best online poker club on the Internet, the Balkan Poker Club. My site focuses on online poker room Titan Poker, which is one of the biggest online poker rooms on the iPoker Network. 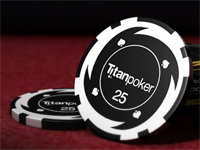 On the Balkan Poker Club website you can find all kind of information related to Titan Poker, including a very detailed review about Titan Poker and the iPoker Network, an enhanced Titan Poker bonus offer, Games, Tournaments, Freerolls and a whole lot more. Titan Poker is a Windows only poker room, but their browser version does also offer the ability to be played on a Mac. But then again, that takes away the option to use PokerTracker or any other comparable HUD software. On this site you can see that they’ve listed Titan Poker among their recommended Mac poker sites while using some sort of Windows emulator software. The answer to the question “Why Titan Poker?” is plain and simple. It was the very first poker room on the Internet where I have played online poker. Titan Poker is the place where I learned the game of poker while playing for fun at the play-money tables and by participating in freerolls , but it’s also the place where my game seriously evolved over the years, after making my first deposit. I am now up to $2/$4 (NL HE, preferably 6 Max) and am proud to say that I am consistently winning. Talking about winning, the idea to create Balkan Poker Club was not only a business decision (business, because I hope to be able to generate some income from referring poker players). This is also my personal poker site where I hope to teach the game of poker to others by sharing the knowledge that I have learned on my path. Even though I occasionally hit the tables at other online poker sites as well, Titan Poker feels most like home. For different kind of reasons (our local tax department is one of them) I can’t reveal my nick name. I sincerely hope you enjoy browsing the content on Titan Poker Club and end up to be just as enthusiast as I am. If you’re new to the world of poker and want to know the rules to online poker, why not read what Play Free Poker.org has to offer before placing your first deposit. PS: The reason behind me selecting a name like Balkan Poker Club as the name of my site is that my grand parents originate from Greece 🙂 and I tend to keep a strong connection with the Balkan region as we usually go there for summer vacations.